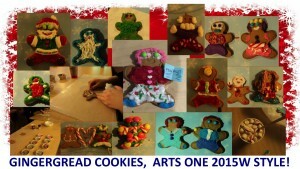 Gingerbread cookies, Arts One style! Yes, that IS Professor Hendricks reading Foucault. (we can tell from the hazel eyes). Right next to Polyphemus from Homer’s Odyssey. Big thanks to all who attended this year’s Arts One Winter Social. Giggles and marshmallows all around, with little Kevin McCallister in the back ground. Good times.